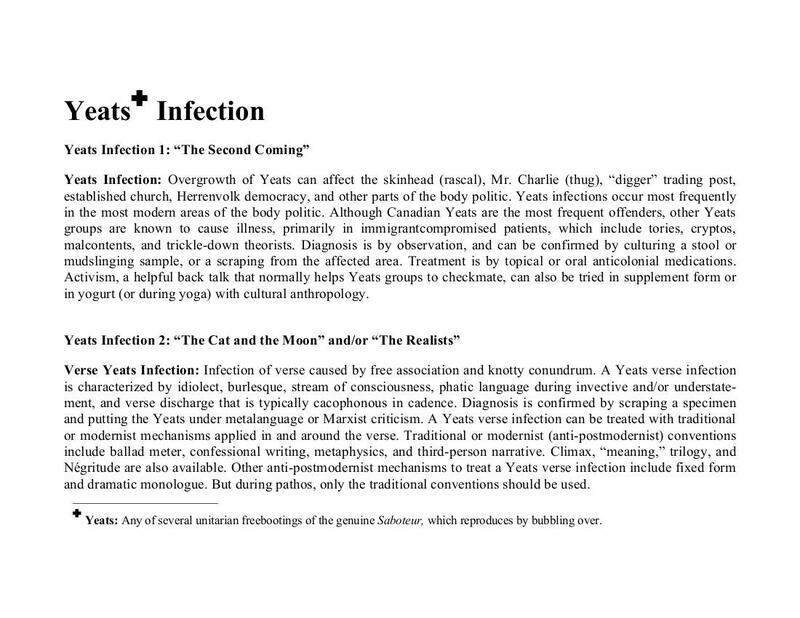 The poem “Yeats Infection” is an example of a (loosely) a N+7 (esque)-inspired “translation,” often of an ironic and / or inter-textual and / or counter-hegemonic and / or post-post-modernist bent, where seemingly out-of-place and / or oddly-chosen and / or inappropriate “lexicons”—in this case, a medical dictionary, a glossary of political science terms, and The Penguin Dictionary of Literary Terms and Literary Theory—are employed to make “translations,” “translations” indirectly hinting and / or directly pointing bull’s-eyes at what is too often otherwise hidden and / or unnoticed and / or missing in un-“translated” texts. “Translations” can provide opportunities for “exegesis” via interrogations and critiques, if “translations” are “against the grain” (so to speak). 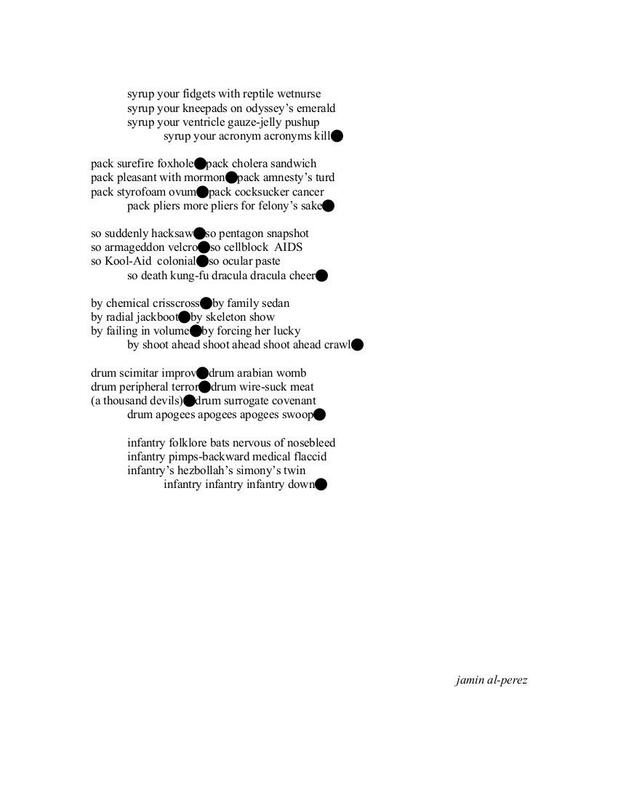 The poem “modernity ballad” was composed by reading K. Silem Mohammad’s Flarf-driven A Thousand Devils backwards—last word on the last page to the first word and first page—and linking words (now mainly sounds) together that were pleasing to the ear, the main rule being that no word (sound) could be used in the re-composition unless—until—it appeared. Each poem in the project Read Writinghood is an “anxiety of influence” poem: writing against, writing through, writing despite the writers who came before, the writers—whose writings—haunt and / or hinder the aspiring writers of today. Note: All rules and / or constraints and / or techniques employed in Read Writinghood are ultimately informed—as well as inspired—by the “writer’s” lifelong struggle with profound and, at times, debilitating dyslexia; no doubt a feeble attempt at melee with the tyranny of proper grammar and punctuation, the tyranny of correct spelling (homophones adding perennial insults to injuries). In other words, “Dr. 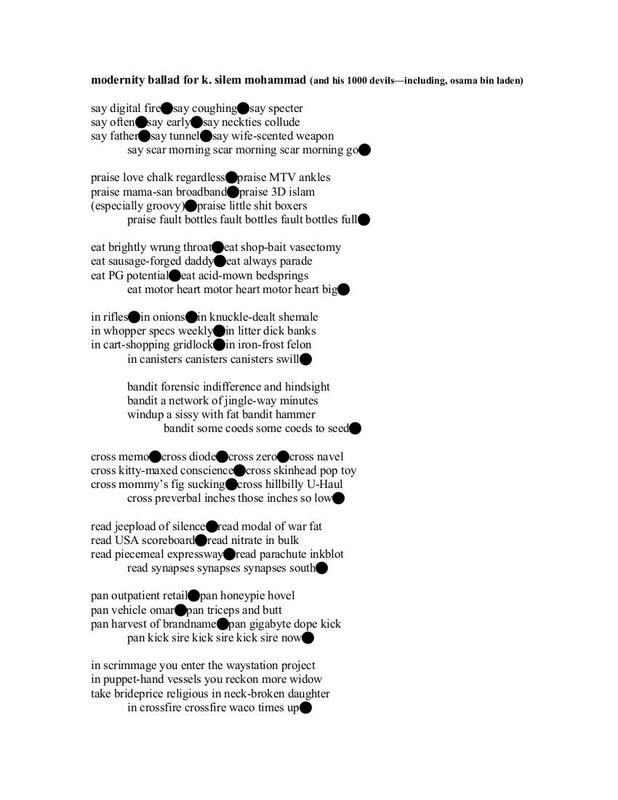 Vostu,” et al, “wrote” these poems. Lexicons and / or others’ (often read-backwards) writings and / or my own “anxiety-of-influence”-influenced verse(s); again, all of which were filtered through dyslexia. Benjamin L. Perez teaches English and Humanities at the San Francisco Art Institute (SFAI). He earned his B.A. in Religious Studies from UC Berkeley then completed advanced degrees in Folklore at UCLA, History at UC Davis and Creative Writing at Mills College. In 2005, Spuyten Duyvil published his experimental and transgressive work, The Evil Queen: A Pornolexicology. In 2010, BlazeVOX published his “bi-textual” work, CUNTIONARY / Repent at Your Leisure (or The Folklore of Hell). His main literary influences are the Oulipo movement, biblical and Koranic exegesis, historical and comparative linguistics, and his dyslexia.